It's never tasted so good to help out those who are less fortunate! IT'S that time of the year again, when Edo Japan does their part to feed those in need! Until January 3rd, Edo will donate 25 cents from every $1.49 spring roll sold to local Food Banks. 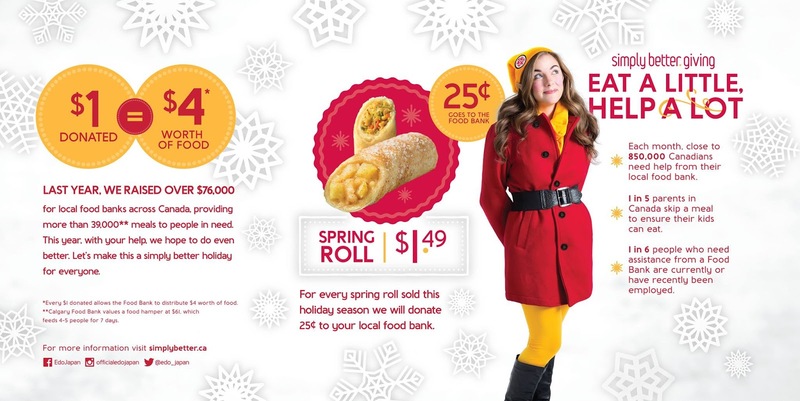 Last year, Edo raised $76,000 through their Eat A Lot, Help A Lot campaign, providing 39,000 meals for Canadian families! This year, they hope to top even that, but they need YOUR help!! Dedicated to serving affordable, delicious and simply better meals, Edo Japan has quickly become a Canadian favourite. With signature dishes like Teriyaki Chicken and Sukiyaki Beef, and a full sushi offering, there is something on the menu to satisfy every craving. You can also follow Edo on Facebook, Twitter, and Instagram!